I first developed the recipe for this cake way, way back in 2011. Years later, this recipe still works exactly as written. I’m usually a hopeless tinkerer, but this cake is undeniable, just as it is. If you look at the list of ingredients, you’ll see that it has 2 full teaspoons of each ground cinnamon and ground ginger. But the spices are perfectly balanced with honey, maple syrup and molasses. There’s only 1 egg in the whole, generously sized cake. So if you can’t have eggs, a “chia egg” would most likely work well here. The batter is quite thick, and relatively sticky from all the liquid sugars. A wet spatula is all it takes to spread it into an even layer in a lined baking pan. I really prefer to line the baking pan rather than greasing it. A greased pan, with all these sugars, means a cake more likely to burn during baking. I’m thinking about doing a super quick video showing you how to easily line any shape of baking pan like a pro. It only took me, like, 15 years of lining baking pans to figure out just how simple and effective it can be. 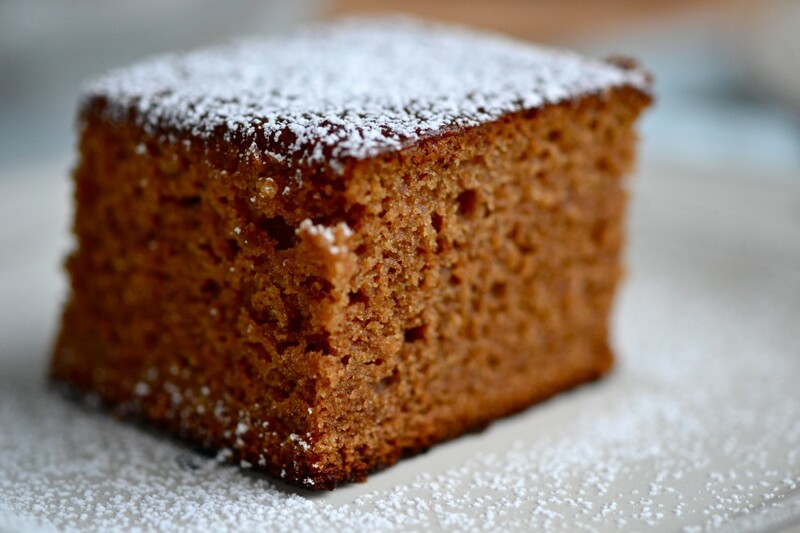 The rich, moist and fragrant goodness of this gingerbread feels just right for Thanksgiving. Bake this cake while you’re serving a big holiday meal, and your friends and family will be captivated by the smell. Since all you need is one bowl to make the batter, it’s easy to throw together at the last minute. Preheat your oven to 350°F. Grease an 8-inch square baking pan and set it aside. In a large bowl, place the flour, xanthan gum, baking soda, baking powder, cinnamon, ginger, salt, and granulated sugar. Whisk to combine well. Add the brown sugar and whisk to combine again, breaking up any lumps. Create a well in the center of the dry ingredients and add the molasses, maple syrup, honey, butter and egg, mixing to combine after each addition. Add the water and oil, and mix well. The batter will be thick. Pour the batter into the prepared pan. Place the pan in the center of the preheated oven, and bake until a toothpick inserted in the center comes out with, at most, a few moist crumbs attached (about 40 minutes). Remove from the oven and allow to cool in pan for 10 minutes before transferring to a wire rack to cool completely. Originally posted on the blog in 2011 (!). Recipe unchanged, photos and text mostly new. I just printed out the recipe. I’m very anxious try give it a try. I was wondering if it would be possible to substitute fresh ginger for the ginger powder? I have tons of it on hand and always prefer using fresh. The powder does not have the same taste. So am I correct in thinking you omit the xanthan gum when you make this recipe because the Better Batter flour already contains it? I’m trying out this exact recipe using the Better Batter flour you recommend and want to make sure I get it just right. I am a seasoned baker who went gluten free just under a year ago. I sort of put my baking on the back burner when I went GF because I was still get used to this new world. I am known for my holiday baking and decided I wanted to get back into the swing of things. I just made this cake (like it’s still cooling on the wire rack), and it is awesome! When I lifted it out of the pan I couldn’t resist breaking off the corner of the cake to taste it. It is soft, moist and tastes amazing. Thank you for your blog! Your recipes are helping me get my baking legs back again. Have you tried making this recipe as cupcakes/muffins..? How many did it make? Well, for no reason except it was an ordinary Wednesday eve, I made this for dessert last eve. I halved the recipe since there’s just 2 of us and we didn’t want a weeks worth of cake. I put it in a 6″ round pan-and it ended up looking like the biggest muffin this side of Texas, but it was delicious. The texture was soft and moist with just the right spice. Since I had no whipped cream (ugh!) I made a nice lemon sauce to top it. It tasted like Mom used to make when I was a kid. Yummy-and thanks for the memories! Sounds delicious, Faith! I’m so glad you made it for 2. Hi there. The recipe says it makes one 18 inch square cake but then calls for and 8 inch pan. Which is correct? Sarah it says “1 8-inch square cake.” Not 1 18-inch square cake. There’s no error. It’s an 8-inch square cake. I apologize, i realized that after I sent the comment. I was on my phone and I read it incorrectly. Can I use Extra Virgin Olive oil instead of vegetable oil? I have pure Maple Syrup, but not molasses – what’s the difference and why both; can I delete the molasses? And regular salt instead of kosher salt ok? I looked around a lot on your site but didn’t see where you might have a list of ingredients that are ok to substitute; e.g. EVOO instead of vegetable oil. Do you have one that I just overlooked? Thank you for your passion and sharing your hard work! Made this exactly as directed, but the batter is extremely watery. It’s lighter than any cake batter I’ve made before. Are you sure the proportions are correct? 1 cup water to 2.5 cups flour and a couple cups of liquid sugar ingredients doesn’t seem right. I have been making this recipe as written for many years, Mary. It is correct exactly as written. It sounds to me like you aren’t using one of my recommended flour blends. If that is the case, most likely you are using one of the blends that I specifically advise against, like Namaste. Nicole – I need to make this vegan as well. Could I replace the butter with Crisco and the egg with something else too? The holidays are complicated with multiple food needs. Thanks for any tips. Hi Nicole, just want you to know I love your blog and ‘steal’ recipes all the time, BUT I feel ok about it since I JUST BOUGHT Little Bites!!!!!! I already bought Bakes Bread and my step daughter has your first book ( : Thank you Thank you Thank you I think you are amazing to do what seems like ENDLESS testing and research. ?? I do have 2 questions…..1:why do you seem to prefer Better Batter over Cup 4 Cup…..BECAUSE OF COURSE I made 10 cups of your C4C GF flour….and it’s a lot of work to create those babies!!! I end up with these fine flours all over my island. 2:Do you have a tip for combining the flours without the flour dust clouds?? Looking forward to Thanksgiving with all your wonderful recipes!!!! I prefer Better Batter over Cup4Cup because, as I explain on my flours page, Cup4Cup is a very high starch blend. It is most suitable for making pastry. It will usually work in most of my other recipes (except for yeast bread), but I correct what I consider to be the imbalance in Cup4Cup in my “Better Than Cup4Cup” blend. The starches will always create a bit of a dust cloud, I’m afraid. Just spoon them out, rather than dumping them into the bowl. That helps. Glad you asked that, though, as I’m creating a video course on GF flour blends, and I will include that tip! I made and use your ‘Better Than Cup4Cup’. So even with the adjustments you’ve made, you still prefer YOUR Better Batter over YOUR ‘Better Than C4C’? Also, you responded to my comment on the waffle recipe, and then I couldn’t get back to the right place to reply. Mine were very heavy, you thought it could be a measurement or ingredients and room temp I think. Everything was EXACTLY how you laid out, I measure with an electronic scale. But later I read somewhere that you were not happy with the consistency of RedMills tapioca flour or potato starch….I forget which one, but of course I have both. so maybe that was the problem. Would it work to cook in a Bundt pan? It should, Billie. You might have to make 1 1/2 times the recipe to have enough batter, though. Nicole, did you ever try to freeze the bread? I need to get things ready well ahead of time for a huge family reunion, this would be great! I’m not sure which bread you’re referring to, Claudette. This recipe doesn’t have any bread in it. Do you think you could bake this in a jelly roll pan and make a gingerbread log? or a lemon custard filling! I can’t wait to make this, I love anything ginger! My husband does not so I guess I’ll have to eat the whole thing myself. It’s not spicy, though, Nancy. It really has just the right balance. You might convert him! This cake is screaming my name! I love that it’s simple to make with easy to find ingredients! So glad, Julia. Thanks for letting me know! I love this – I love the ingredients, the lightness and the smell…. but mine never cooked all the way through! I did 30 minutes and then another 10. And then I thought it was done but only the outer part was done – the middle was mush. So I put it back in until the top was pretty burnt but still the inside is very wet, not at all as crumbly beautiful as your picture. I’m not totally disappointed in it because it’s edible, just not something I’d take to someone’s house. I’ve always thought our oven had a cooler temperature, since everything always requires the maximum amount of cooking (as in 12-15 minutes for cookies will be 15 or 17 minutes for me). I did use Better Batter – I love using Better Batter for your recipes – it just works. I still love the flavor and I’m not giving up… maybe I’ll try it again if I’m not distracted by another post of yours with something else delectable to bake! Thank you, Thank you, THANK YOU! I just started looking for a gf gingerbread recipe and here it is. Back in my days of eating all things gluten, I would make a Paula Deen gingerbread trifle for Thanksgiving. Very delish, and now I can make it even better with this recipe. Yay! This looks like a wonderful recipe! I’m planning on making it sometime in the near future. With just the two of us it takes awhile to finish a dessert. all this molasses & gingerbread talk makes me think of soft molasses cookies my gram used to make….i have to hunt down the recipe….and convert…. (I MIGHT just share….). with a good cup of java…mmmmmmm. Makes me smile thinking of her! Food is so nostalgic this time of year, isn’t it, Pam? I love it! I forget sometimes how much I love gingerbread and everything you put in there sounds delicious. I’m going to make this soon. Big fan of blackstrap molasses and maple syrup. Have a fantastic Turkey Day, Nicole! Hugs. Am going to be all over this one, Nikki. 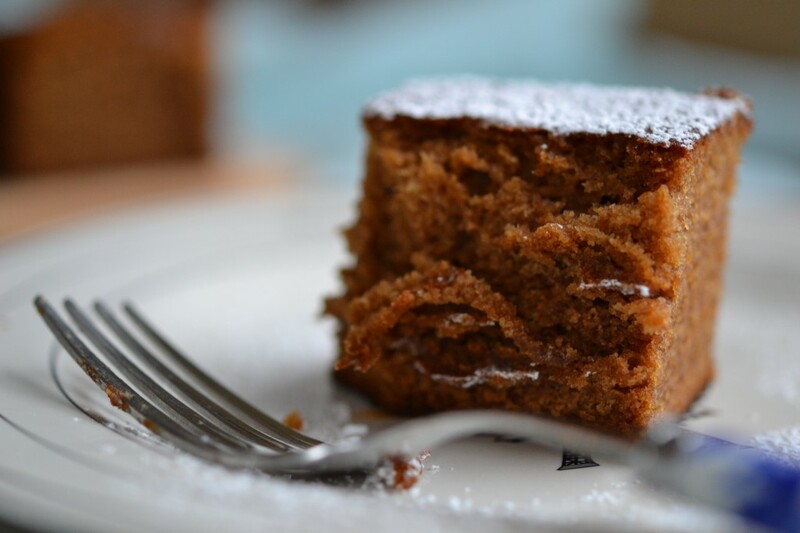 Add gingerbread to my weekend–and blackstrap yes! I was so happy to find GF blackstrap molasses a while back. Can’t beat the taste! Years and years ago, my grandma made gingerbread cake. If there was any left the next day (big ‘if’), she would make a lemon syrup to liven it up a bit–delicious. Oooh lemon syrup sounds amazing with gingerbread cake, Linda. Sign me up! I love blackstrap molasses, too. So does my husband. He’ll eat anything with that deep, rich flavor in it. Love the nostalgia! Did somebody say “black strap molasses”?!??!?! That’s what it took for you to post a comment on the blog. 2 1/2 years blogging, nothing. Blackstrap molasses, and you jump in? You ate this last night, hon. You loved it. Have a LOVERLY weekend, Nicole…I’ll be baking and smiling…because Scott loves it when I bake…and he’s decided he loves you, too! Thanks! :) Mollycake’s loves you too!!! that is as long as she can be a tester…which I daresay she is here! I love gingerbread cake! It reminds me home. Thank you.